Admissions staff from Mount Wachusett Community College will be participating in a college fair at Mount Ida College on Tuesday, April 17. 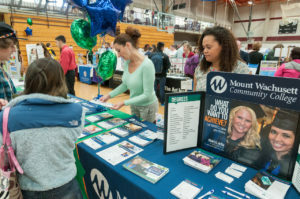 Admissions representatives from Mount Wachusett Community College will be participating in a college fair at Mount Ida College on Tuesday, April 17 as MWCC encourages Mount Ida students to explore transferring to the college. Rosbury-Henne explained that in addition to students on an Associate’s Degree track with Mount Ida, first and second year students, as well as those enrolled for the fall, could choose the two-year degree equivalent of their original bachelor’s program. Through the Mass Transfer program or the college’s many articulation agreements, students could then transfer to a four-year institution to complete their degree with a possibly considerable cost-savings. Rosbury-Henne said that students in specialized programs such as Vet Tech, Dental Hygiene and Criminal Justice need to be especially selective when thinking about their next school. These programs are not only hard to find elsewhere, but especially at an affordable price. Jason Zelesky, Dean of Students, said that the students transferring to Mount Wachusett would find a welcoming community at The Mount. “From one Mount to another, we are a family and we welcome every student to this college,” said Zelesky. Students who are unable to attend the college fair are encouraged to reach out to Rosbury-Henne at 978-630-9110.